Nissan said it was able to lower the curb weight through design efficiencies and with the selective use of high-strength steel, particularly in areas beefed up for better side-impact protection. While no 2015 specifictions were released, if you knock off 130 pounds from the current Murano’s heft you get curb weights for the 2015 model that will range from 3693 to 4025 pounds. That’s less than V6-powered competitors like the Ford Edge and Toyota Venzabut a little more than four-cylinder competitors like the Hyundai Santa Fe and Ford Escape. 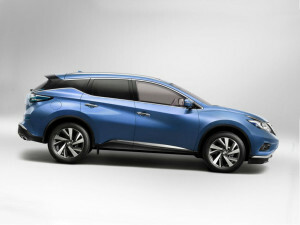 0 comment(s) so far on New 2015 Murano Holds its Concept Form!